Ski resorts in the eastern U.S. and Canada had a terrible month in December, thanks to unusually warm temperatures. This run on Mont Rigaud, Quebec, suffered from little snowfall by December 26. Scientists pin the blame on El Niño and climate change. Scientists have confirmed that 2015 was the hottest year yet recorded, smashing the previous record, which was set in 2014. During 2015, the average temperature across global land and ocean surfaces surpassed the previous record, set last year, by 0.29°F (0.16°C)—making it the largest margin yet. 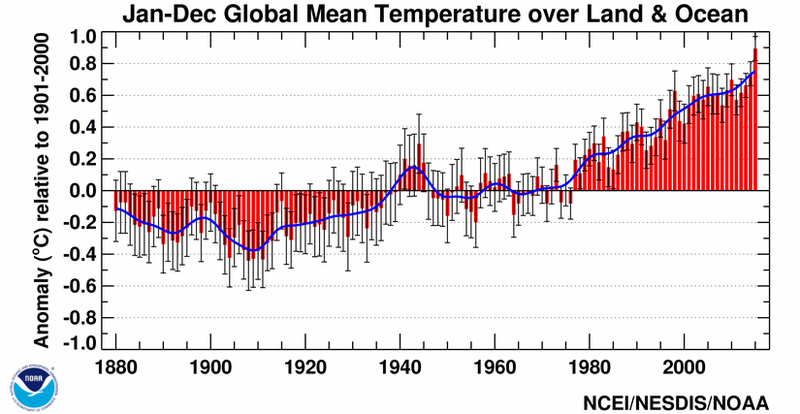 2015 was 1.62°F (0.90°C) above the 20th century average, reports the National Oceanic and Atmospheric Administration. This was the highest among all 136 years in the 1880–2015 record. Last year was also the fourth time a global temperature record was set since 2000. Every month except January and April was the hottest yet. Although a strong El Niño this year has contributed to warming, the bulk of the rise in temperatures can be attributed to human-induced climate change, science agencies report. This record warmth was spread over most of the planet, with only small pockets of cooler temperatures seen off the tip of South America and in the North Atlantic. In the continental U.S., 2015 was the second-hottest on record, marked by a December that was tens of degrees warmer than usual across much of the country. The United Nations’ World Meteorological Organization has argued that the recent warming has surpassed "symbolic thresholds," just as world leaders agreed to aggressively target global warming when they met in Paris late last year.